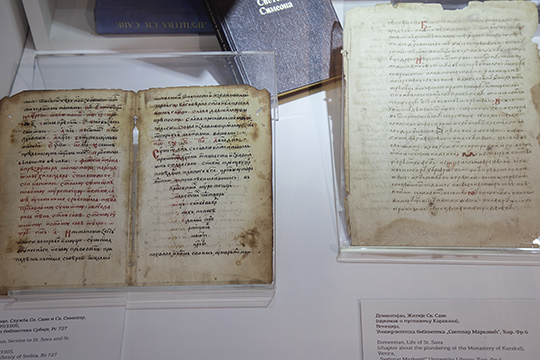 The „Saint Sava of Serbia” exhibition was opened on Tuesday, 5 July 2016 at 12 a.m. at the Historical Museum of Serbia at Trg Nikole Pašića. After the introductory words of Dr. Dušica Bojić, the Director of the Historical Museum of Serbia, and Dr. Andrej Vujnović, the author of the exhibition, the exhibition was officially opened by His Holiness Serbian Patriarch Irinej. The exhibition has been realized with the support and patronage of the Ministry of Culture and Information of the Republic of Serbia. 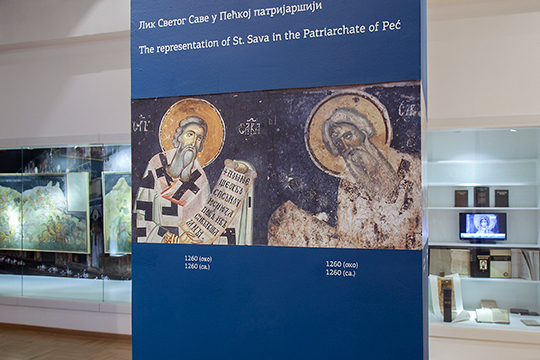 The multimedia exhibition „Saint Sava of Serbia” is the result of the years-long research of the author and intends, through archivalia, copies of frescoes and icons and photographs of St. Sava’s personal belongings and his relics, to offer the public deeper insight of his secular and spiritual life, as well as of the significance of his personality for the Serbian state, the Serbian Orthodox church, and the entire Serbian history and culture. 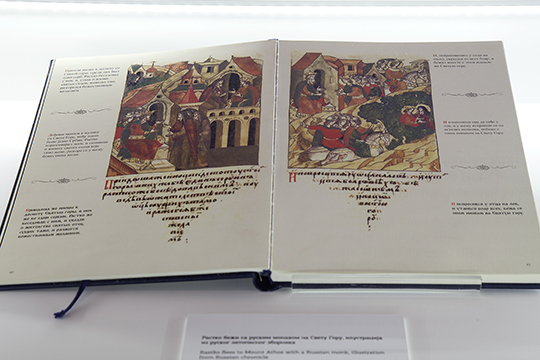 The exhibition presents the life of Rastko, the third son of Stefan Nemanja, Grand Prince of Raška: his escape from the powers of this world to Mount Athos, where he became a monk and received the name of Sava; his work on gaining the autocephaly and autonomy of the Serbian Orthodox Church at Nicaea, where he became the first Serbian archbishop; his zeal to improve church organization; his state-building and diplomatic activities which resulted in, among other things, the international recognition of the kingdom of Serbia; as well as his versatile and immeasurable contributions in the fields of enlightenment, literature and ktetorship (reconstruction of the Monastery of Hilandar, and the erection of Žiča, Studenica and other monasteries). All this made St. Sava the most significant figure of Serbian history. St. Sava was already regarded as a saint during his lifetime, but with the transfer of his relics to Mileševa, the establishment of his cult was completed, to be nurtured also by the Russians, Greeks, and Bulgarians and the faithful of other neighbouring countries. A century and a half after the conquest of Serbia, identifying the cult of Saint Sava as the cult of the ‘old Serbian state’, which the Serbs wanted to restore, the Turks in 1594 set fire to his relics in Belgrade. 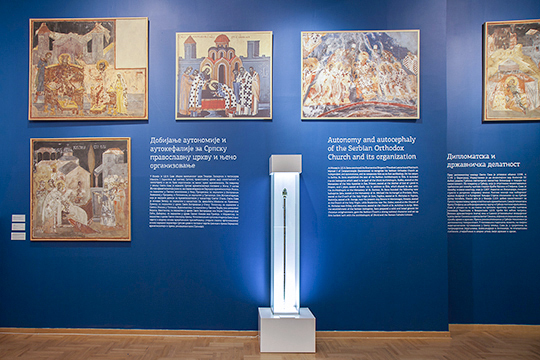 The exhibition has been supported by the National Museum in Belgrade and Gallery of Frescoes in particular, the ‘Svetozar Marković’ University Library, the National Library of Serbia, the Archives of the Serbian Academy of Sciences and Arts, the Yugoslav Film Archive, the Archive of Radio Television of Serbia, the Institute of Musicology of SASA, the Scientific Library in Zadar, the Republic’s Institute for the Protection of Monuments of Culture, the Foundation of the Monastery of Hilandar, Bishop Joanikije of Budimlja and Nikšić, Archimandrite Tikhon of Studenica, Mrs. Danica Popović, Mr. Miodrag Marković, Mr. Bojan Miljković and Mr. Dragiša Milosavljević. The exhibition is open until 28 November 2016.